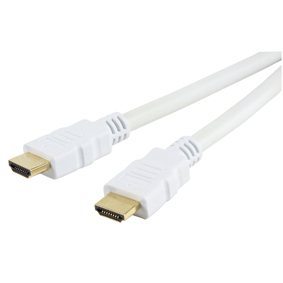 White HDMI Cable 5M - Medium length hdmi cables., Hdmi Cables Same Day Dispatch On Our Leads If You Order Before 2pm Weekdays. HDMI combines high-definition video and multi-channel audio in a single digital interface to provide crystal-clear digital quality over a single cable. HDMI offers significant advantages over analog A/V connections, including the ability to transmit uncompressed digital video and audio content. Currently viewing: White HDMI Cable 5M - Medium length hdmi cables., Hdmi Cables Same Day Dispatch On Our Leads If You Order Before 2pm Weekdays.